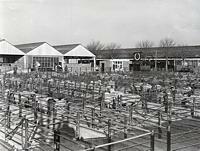 ExeterMemories - Cattle Market, Marsh Barton. Exeter has long been a centre for cattle sales from the many stock farmers around Devon. In former times, livestock was sold in the streets, including the High Street, causing, on market days, much chaos and noise, along with animal smells. The building of the Higher and Lower Markets in the 1830s, precipitated moving the livestock markets down to a site, between Bonhay Road and the river, just north-west of the Exe Bridge. The Exe Bridge was often clogged with flocks of sheep, or herds of cattle, being driven across to the market. 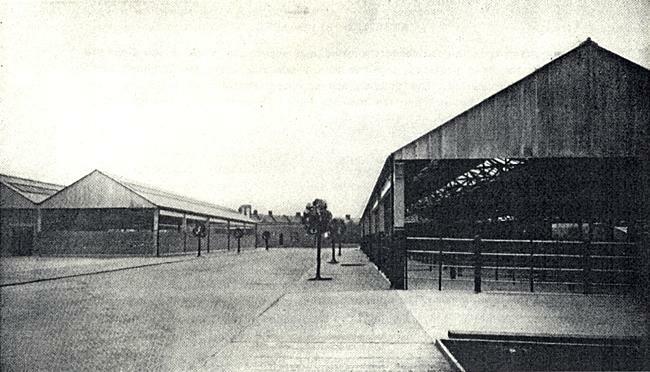 By the 1920s, even with the growth of motor transport, it was apparent that the Bonhay site was no longer adequate, and a search was made for a new home for the cattle market. Discussions were held as early as 1932, with the Ministry of Agriculture, into a new cattle market for the city. Then, in 1935, an enquiry was held to consider various sites for a new market. Flower Pot Fields was considered, at a cost of £90,000, but it had poor access, and was on land intended for playing fields. An extension of the Bonhay Market to the land on the opposite side of the road, (now Renslade House) was also considered, at a cost of £98,000, but the lack of rail sidings and poor access remained. Other sites were turned down, such as part of Exwick fields, on the opposite bank of the river from St David’s Station, and a site near Hamlyn’s Lane, off the Pinhoe Road. All were discarded due to access problems. Eventually, some vacant land off the Alphington Road, opposite a small throughway known as Stone Lane was selected, after the City Council voted 26 to 20 for the scheme. The charging of tolls, the making of bye-laws, and other matters could not be made for an area within the jurisdiction of Devon County Council. During March 1937, the Council, along with Devon County Council, applied for an order to the Ministry of Health, to alter the city boundary, and ‘acquire’ 16½ acres for Exeter. Within a month the Council was firming up its plans for the market, and they had approached the Ministry of Agriculture for permission to borrow £111,000. It was intended to include an abattoir, railway sidings, ample car and lorry parking, and space for expansion in the future. 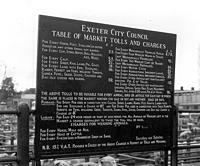 Exeter City Council's City Engineer and Surveyor, Mr R H Dymond directed the design of the market, who invited tenders for the construction, which were being submitted by July 1938. Tenders from Hadsphaltic Construction of London, as the general contractors, William Gratix & Sons of Manchester for the pens, and E C Lea & Co, of Exeter as the building contractors. After a wait of six years, when the new market was first proposed, construction commenced, and by the autumn of 1939, the facility was ready. 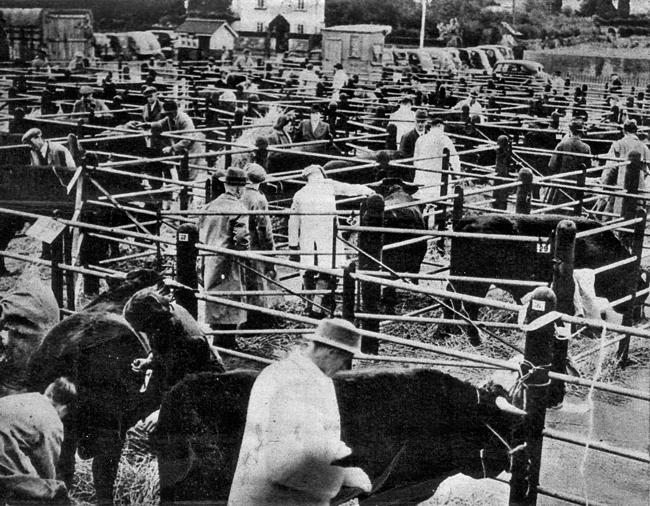 The outbreak of war on 3 September 1939 did not intervene to prevent the first event at the new market, and on Wednesday, 4 October, the eighty-third annual Devon Cattle Breeders’ Society Show was held. Although the market was not yet finished, there were sufficient facilities in place for the show to go ahead, and it was thought that the show would be a good test for the market. The modern range of auction rings and covered areas were well received by the crowd, as was the car-parking, and easier access and exit from the site. 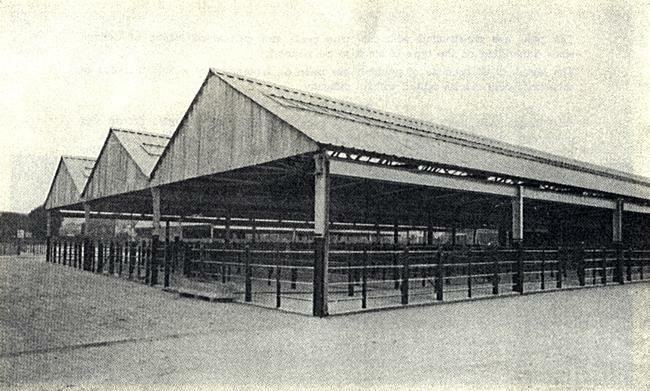 One herdsman declared “that the beasts looked twice as large in the new stalls as they would have in the old market in the Bonhay-road.” The new market was the first to be opened under the Livestock Commission Scheme. 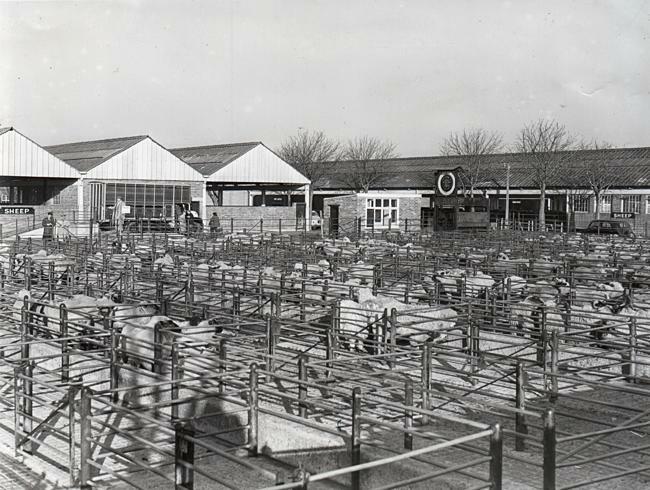 The Marsh Barton Cattle Market, as it came to be known, was opened for business on 1 November 1939, by Mayor Glave Saunders, when he unlocked the gates with an inscribed silver key. Mr. Vincent Thompson (chairman of the Special Building Committee) said that a large sum of money had been spent mainly for the benefit of the livestock industry in Devon, and it was up to that industry to make full use of what could be described as "almost the best market in the country." "Exeter's future, as its present and past has been, is bound in agriculture hope… that the city's enterprise and the provision it had made for the future extension of the market will show that we in the Westcountry are not suffering from what is commonly known as the 'jitters.' "
The market had cost £78,028 16s 8d (they were precise), and it was estimated that about 5,500 stock-cattle, sheep and pigs could be penned on market day. The market could accommodate the following animals on market day. Permission was given for the Corporation Transport Department to extend the A route on Fridays to Marsh Barton Lane between 10am and 3pm, to serve the market. The Western Times reported on the day of opening, that farming had beent changing, not only due to the war, but because of modern innovations. Although farmers had been mechanising in greater numbers, since the war started, a large number of horses had been fetching good prices. A report in October 1940 said that there was a new tractor shortage, and mechanised farmers were having to return to their old farm horses for the autumn ploughing. Through the war years, there continued to be a demand for working horses, and the prices fetched at the cattle market remained high. In the 19th Century, the abattoir in Tudor Street was famed for the blood gushing up through the drains, into the street, when the Exe was in flood. As early as 1928, the abattoir was causing concern, and in 1947, the Women's Institute roundly condemned the facility stating "that if a private organization and not the Ministry of Food were responsible for the abattoir, the people concerned would have been in gaol long ago." One delegate said that "the noise of bellowing animals which came from the abattoir was appalling and the conditions were a disgrace to a fine city like Exeter." She had seen the slaughter hall where calves were killed. Pools of blood covered the floor of the hall where the beasts were dragged in and killed beside other dead and dying animals. 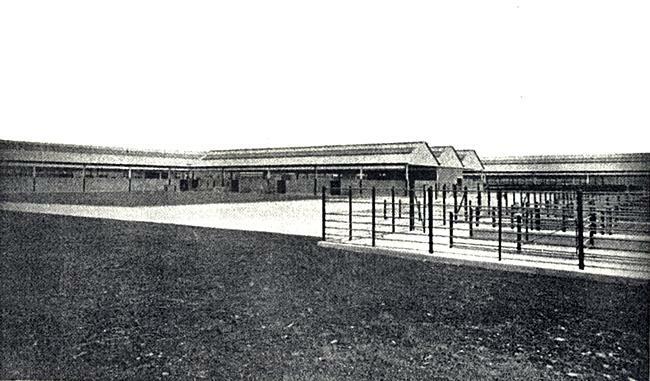 The new facility at Marsh Barton reserved two and a half acres for an abattoir, but it was never constructed. The Tudor Street abattoir was supposedly closed in January 1950, apart from 'casualty beasts' (injured animals), according to the Western Morning News. However, no one seems to have informed the management of the abattoir, and the last listing in Kellys was 1965. It is probable that it remained open until the replacement was ready for business. A new, privately run but licensed abattoir was up and running by 1967 as the 'FMC (Meat) Ltd, City abattoir' at 19 Marsh Green Road, Marsh Barton. The Marsh Barton cattle market continued its sales until 1991, when it was relocated to a purpose built facility at Matford, on the opposite edge of Marsh Barton. The Matford market is one of the largest in the South West and runs from Monday to Friday. Special breed shows and sales are held. There is a small indoor shopping mall to serve the dealers, farmers and auctioneers. The site is also used as a very successful Sunday morning car boot sale venue. In July 1938, when the City Council were negotiating to move the Bonhay Cattle Market out to the city boundary, they agreed to purchase ¾ of an acre of land from Mr Physick, and sell it on to Carr and Quick, licensee of the Seven Stars Hotel in Okehampton Street. 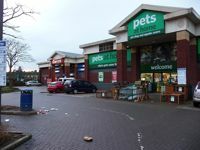 The license would then be transferred to new premises on the land. No progress was made by February 1940, due to the outbreak of war. It was in 1965 that the Seven Stars was opened opposite the new cattle market at Stone Lane. Les Havill, was the first landlord, who managed it on behalf of Bass & Co. until November 1967. In 1938, the City Council decided to purchase Crawford Lodge, and the adjacent land behind Omega Villas for some additional land for the cattle market. The intention was that the Lodge would be a hotel – however the owner, Mr Claridge, was not prepared to sell the house. The house and land was compulsorily purchased – the house was then offered to the breweries as a hotel, with the City Brewery, offering the highest price. It was converted into a hotel, which opened in October 1939 as "...the best equipped hotel of its size in the City". 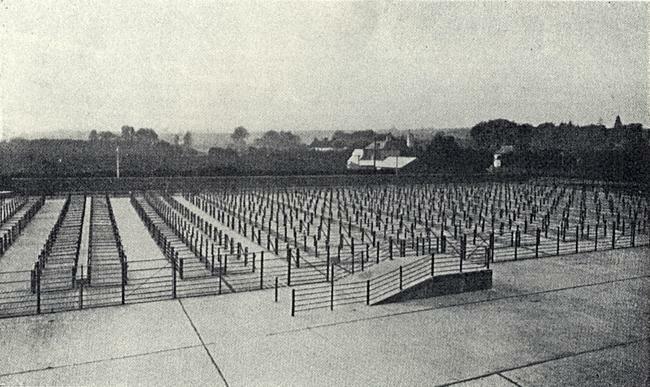 Part of the garden, and the additional land at the rear were used for the administration buildings for the market. Sources: Exeter and Plymouth Gazette, Western Times, Western Morning News. The stock pens at the Marsh Barton Cattle Market. Courtesy Express and Echo. The Devon Cattle Breeders' Society sale ensured busy stock pens in 1943. 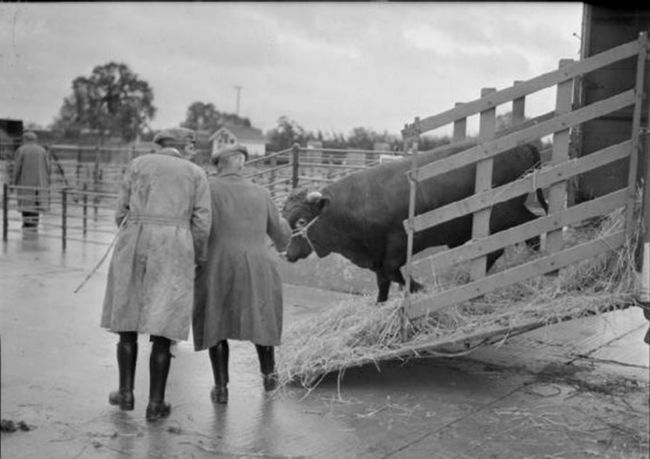 A bull being led off a trailer in 1943. The board showing the market tolls, 1986. Courtesy of Ray Harrington. 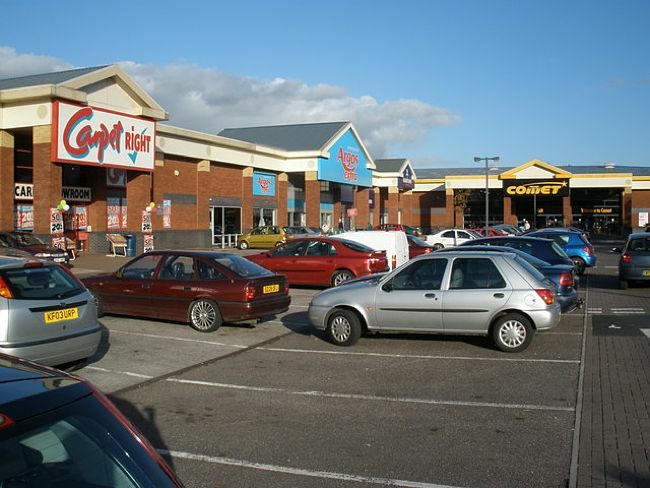 The Stone Lane Retail Park, the former site of the cattle market. © Roger Cornfoot. Creative Commons Licence. 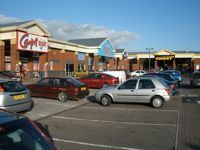 Another view of the retail park. © Lewis Clark. Creative Commons Licence. Fat pig (left) and fat vacattle pens. 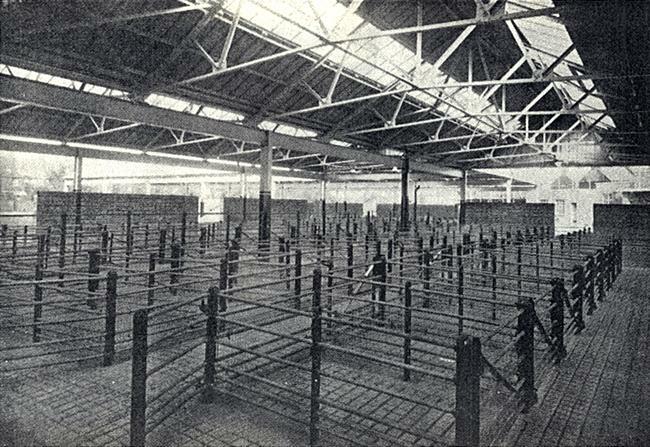 Interior view of the fat pig pens. General view of the sheep, fat pig and store pig pens. The undercover fat cattle pens. 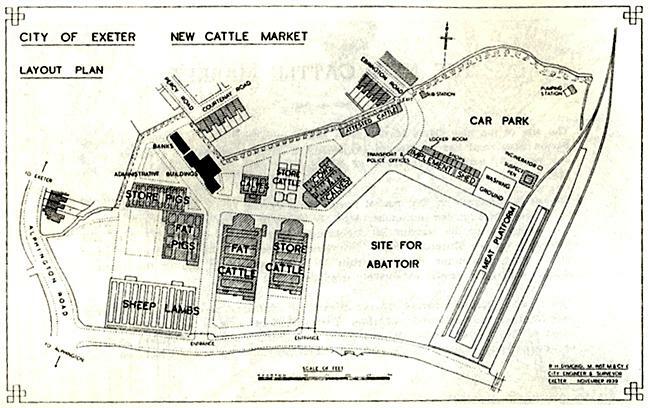 The plan of the market - notice the space allocated for the abattoir that was never constructed. 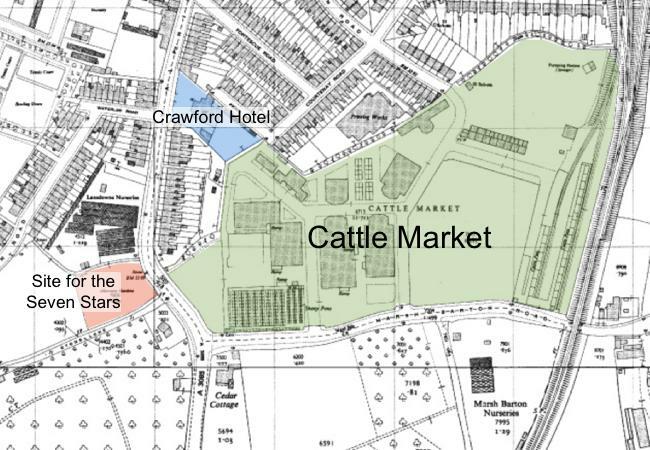 The site of the new Cattle Market is in Alphington Road, at the junction of Marsh Barton Lane, and has an area of 14½ acres, of which 1¾ acres are available as a carpark, 2½ are reserved as a site for a new abattoir and 1¾ acres for sidings. 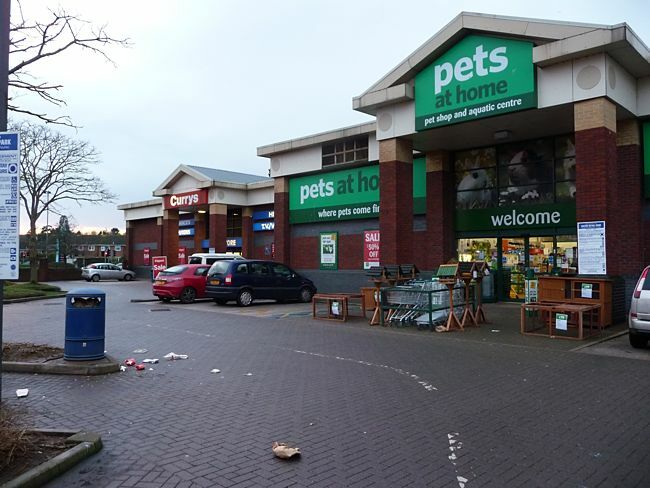 Access is provided to the market from Marsh Barton Lane, which was widened to 42 feet, through two entrances, each 30 feet wide. Roadways of similar width are continued in the market as circulating roads leading to the car park and giving an exit to Ebrington Road. No vehicular access to the market is provided direct from Alphington Road in order to avoid congestion during the summer months when this road is extensively used by tourist traffic. The roads within the market are constructed of reinforced concrete 7 inches thick and finished with coloured concrete. Each block of pens is served by one or other of the internal roads but no loading or unloading will be permitted on them as ample space adjacent to the pens has been provided for loading facilities.